This is a great itinerary which has a fantastic balance of wildlife, tribal interaction and scenic views. Strongly recommended and a proven winner! You will meet and visit the Mangati and the Hadzape, both traditional enemies of the neighboring and more famous Masai, and who follow a different way of life, which is more akin, in both style and language, to the Bushmen of the Kalahari in Southern Africa. A full crew will accompany your expedition to take care of all the work and details involved in setting up and moving the mobile camps. 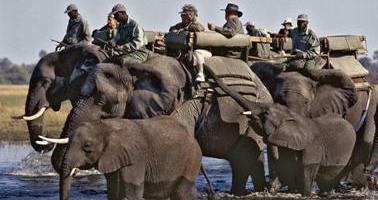 Combination Mobile Camping and Accommodated Safari. Meet and assist at Kilimanjaro International Airport by our local representative for assistance. Transfer to Kia Lodge for dinner and overnight. The lodge is situated on a secluded hill in the heart of beautiful savannah scenery that is so typical for East Africa Centrally placed between the northern towns of Moshi and Arusha, KIA Lodge is ideally situated whatever your onward journey be it climbing the world's highest free standing mountain or starting a safari into some of Africa's amazing and unique wildlife wildernesses such as the Serengeti National Park and Ngorongoro crater to name just two.. Guests can admire the vast views of the African plains and of course the grand Kilimanjaro Mountain which shows her snowy top mostly early in the morning and at sundown. Breakfast. Depart by your private 4x4 Sinya Safari vehicle and drive to the Maasai lands of West Kilimanjaro. You drive in the rain shadow of Kilimanjaro heading to the beautiful Woodlands of Sinya – this is a private reserve run in partnership with the very Traditional Sinya Maasai people. Arrive for check in and lunch at the semi permanent tented camp of Kambi Ya Tembo under the looming Mount Kilimanjaro. PM set out for afternoon game activities in Sinya. Dinner and overnight at Kambi Ya Tembo. Breakfast. Set for a full day of game drives in Sinya. Meals and overnight in Kambi Ya Tembo. Kambi Ya Tembo, which faces the snow-capped peak of the Kilimanjaro, offers traditional tented accommodation in 10 luxury tents with en suite facilities. It combines luxury and warm African hospitality with the best culture and nature experience. Activities include game drives in open vehicles; night game drives to see the nocturnal animals and walking safaris escorted by Maasai warriors. Cultural interaction with the local Maasai, visiting bomas, the market, the village school or when available, the participation in traditional ceremonies that will make a visit to Sinya the most unforgettable experience of a lifetime. Sinya conservancy is a private concession of more than 75.000 acres, bordering Kenya's Amboseli National Park, the offers spectacular landscapes, excellent game viewing and close interaction with the local Maasai. Mixed woodlands and grassland and rocky peaks dominate the area. The areas wildlife and bird life are representative of the Somali Maasai biome and offer a unique chance to see the gerenuk antelope, Yellow baboon or a lesser kudu and at night striped hyena is a real possibility. Sinya is the home to a population of huge elephant males carrying some of the largest tusks left in Africa, these peaceful animals are a real treat to observe. Breakfast. Drive to Tarangire. Lunch at Oliver’s. Game drives in Tarangire. Dinner and overnight at Oliver’s Camp. Breakfast. Full day of game drives in Tarangire National Park. Meals and overnight at Oliver’s Camp. Oliver’s Camp is a luxury tented camp situated in a remote area of the park, in the middle of Tarangire's un-spoilt wilderness zone. The camp is ideally placed to access the yearly migrations of wildlife throughout the ecosystem, and to view the impressive concentrations at waterholes for a 6-7 month season each year. Game drives explore Tarangire national park. Tarangire National Park In Tarangire it is the vast number of baobabs that first captures the eye. An expanse of gently rolling countryside is dotted with these majestic trees, which seem to dwarf the animals that feed beneath them. All year long huge herds of elephants roam the park. During an afternoon game drive it is possible to see hundreds of elephants congregating down at the river, drinking and bathing. The park is truly spectacular in the dry season when many of the migratory wildlife species of the Maasai steppe come back to the permanent waters of Tarangire River. Herds of wildebeest, zebras, eland and Oryx gather to stay in Tarangire until the onset of the rains when they migrate again to good grazing areas. 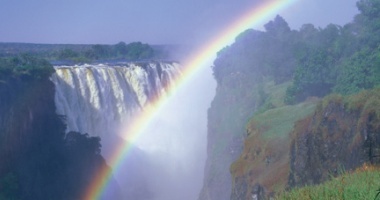 National Park covers approximately 2600 square kilometers. Breakfast. Drive to Lake Manyara National Park with picnic lunches. Arrive in the park and proceed on game drives. Drive to remote Lake Eyasi for check in, dinner and overnight at Kisima Ngeda Tented Camp. Lake Manyara National Park, this is one of the most diverse of Tanzania’s national parks, a tiny (325km²) combination of Rift Valley Lake, dense woodlands and steep mountainside. Made famous by elephant researcher, Dr Iain Douglas Hamilton in his book, ‘Among the Elephants’. Manyara was established specifically to protect the elephant herds that have made the area world-renowned. But heavy poaching in the 1970’s and 1980’s decimated the herds, although they are now recovering and returning to their former strengths. In the early morning, after taking tea & coffee in camp, you proceed driving with a local guide into the surrounding hills in search of the Hadzabe Bushmen, arriving at their last known site of camp you proceed after them on foot. Upon meeting them you are introduced to the village members. Visit their tiny huts, see how roots are dug and prepared and follow the men on the hunt, led in the wildlife rich woodland between towering Baobabs and acacias. The men are armed with long bows with poison tipped arrows, which you can see produced in the village and home made axes. Lake Eyasi basin is remote; a dry area of desolate beauty, which offers a great natural experience. Across the shallow lake and the dry salt beds the dramatic Alipi escarpment wall rises 650 meters up into the Endulen area of the Ngorongoro. The area is the home to a very traditional group of tribes such as the Datooga and Hadzabe. Visitors reach the lake through its northern end, on the border of Ngorongoro Conservation area. The northern lakeshore houses, Mangola, an agricultural settlement, which serves as a center to the many traditional tribes in the area. Further away the area keeps to very traditional rhythms. Visits to the fiercely traditional Datooga. After breakfast, drive to Ngorongoro highlands. Arrive and descend into the crater floor for half day crater tour with picnic lunches. Ascend and drive to Ngorongoro Serena Lodge for dinner and overnight. Ngorongoro Serena Lodge is a large chain lodge built on the Forested northeastern rim of the Ngorongoro crater with dramatic views into the crater and over the surrounding forest. The lodge's location is great if you want to explore the highlands or forest by foot or bird this unique habitat. It is also ideally located to explore the Ngorongoro Crater with its own comfortable ascent and descent road. 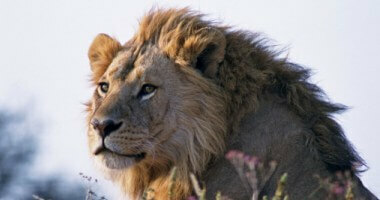 Ngorongoro Crater is quite possibly the most famous of all Africa’s conservation areas. It is the largest intact volcanic caldera in the world. Covering a mere 260km², the 600 meter deep crater is home to a permanent population of more than 30,000 animals, and is one of the only places in Africa where you stand a real chance of seeing the “Big Five” in the course of a morning or evening’s game drive. Unique to the crater are the local Maasai grazing their cattle on the crater floor, and it is not unusual to see Maasai cattle and buffalo grazing together, with a lion kill just a few hundred meters away. After breakfast drive to Serengeti National Park with picnic lunches. Arrive in the park and proceed on game drives. Dinner and overnight in Serengeti Classic Camping. Breakfast. Full day of game drives in Serengeti. All meals and overnight in Serengeti Classic camping. Your large and spacious walk in tent will come with en-suite facilities, separate W.C.’s and romantic alfresco bucket showers. Enjoy delicious Pan-African and traditional bush cuisine. This is the soul of Africa – no mains electricity and no running water – lose yourself in the relaxing solitude of the mighty Serengeti, far from civilization. 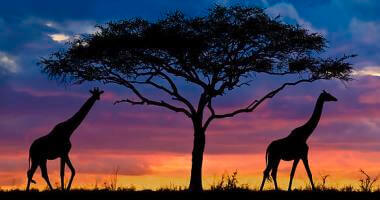 The name Serengeti stems from the Maasai word "Siring" referring to "endless plains", and that’s really what it is. The Serengeti is vast, stretching from the endless grass plains in the South to the woodlands in the north up to the Kenyan border. The size of the Serengeti eco-system as a whole is virtually the same size as Belgium. The Serengeti hosts the largest concentration of wildlife in the world, thought to be more than 3 million, and is home to one of the great wonders in the world, the Great Migration. Over a million of Wildebeest move annually from the southern plains, where they give birth in December - March, to the north and the Mara River, and back, accompanied by Zebra and other migratory mammals. Lion, cheetah, hyena, hunting dog and crocodiles make sure only the strongest survive. After breakfast in the lodge, transfer by lodge vehicle to airstrip; Fly to Arusha by morning scheduled flight at 0920/1200hrs. Arrive and meet your private transfer to Kilimanjaro airport via Shanga River House for lunch. After lunch proceed to Kilimanjaro to connect to your outgoing international flight back home. Rates from $6,800 per person sharing. Please contact us for a quote based on your envisaged period of travel.